It’s amazing what a common goal can do to unite people. Marissa and Alma are two Mountain View (Marana) High School students who never quite saw eye to eye. Marissa is outgoing, Alma isn’t very comfortable speaking in front of a group. At the beginning of their senior year, they would dread working together on projects, just knowing that they have different ways of approaching and completing it. When two of their teachers, Ms. Moraga and Mr. Class, strongly suggested they become involved in the JTED Early Childhood Education program and FCCLA (Family, Career and Community Leaders of America), they somewhat reluctantly accepted, not yet seeing what their teachers saw in them. They were tasked with the Chapter Service Portfolio, an important project detailing the good works their fellow FCCLA members were doing in the community. Once they found the Ronald McDonald House Charities as their focus, any differences in personality became complementary strengths. The thing that mattered most now was motivating their club, their school, and their community to care for and support critically ill children and their families. Alma and Marissa conducted a school-wide Wish List drive, communicating with almost 250 faculty, uniting the school around a shared mission. They recently visited the Ronald McDonald House and donated about ten thousand pop tabs along with household items that will help RMHC families every day. They presented this project earlier in April at the statewide FCCLA conference, earning second place among all Arizona high schools. As a result, they will travel to Nashville, TN to compete at the National level. 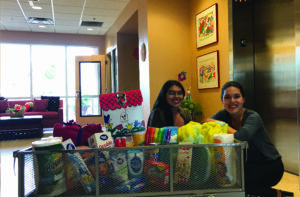 The Ronald McDonald House Charities is very thankful that Marissa & Alma have been filling buckets for the 600 families that stay at the RMH each year. We wish you the best of luck at Nationals. If you are interested in setting up a service project or Wish List drive of your own visit our How to Help page or call us at (520) 326-0060.